Over the years I have been fortunate to taste many of Bruno Giacosa’s wines. This comprehensive vertical of the Barbaresco Santo Stefano, held over two evenings and going back to the inaugural 1964, was truly unforgettable. There were plenty of surprises from a number of dark horse vintages, while the epic Red Label Riservas once again proved why these are some of the most coveted wines in the world. Above all else, though, the wines were a poignant reminder of the genius of Bruno Giacosa. Bruno Giacosa was born in 1929 in Neive. 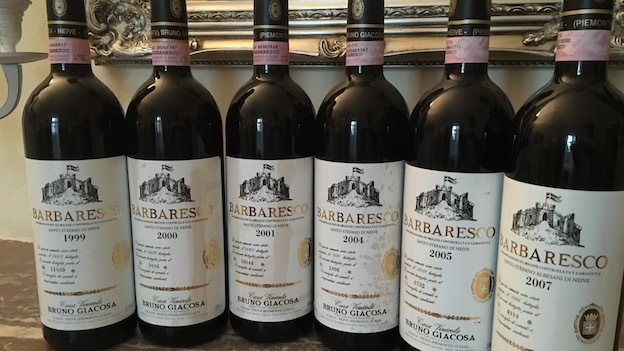 Giacosa’s father, Carlo, was a commerciante (a grape broker) who bought grapes from small growers and families and then sold them to one of the large firms that bottled Barolo and Barbaresco. These were very different times than what we see today. Farmers subsisted, if they were lucky, on a variety of crops, including grains, grapes and various animals. No more than a handful of large, commercial firms bottled and sold Barbaresco and Barolo. Because of their size, those companies controlled the market. As a young man, though, Giacosa had his sights on something else. He wanted to make his own wine, as the family had in prior generations. That thought was blasphemous to Giacosa’s father, who violently opposed the idea because the young Bruno would have serious conflicts of interests. Who would get the best-looking grapes from a given site? Giacosa’s grape customer, or the new Bruno Giacosa winery? Giacosa opposed his father and went ahead with his plans anyway, showing that cool determination and strength that has always been one of his traits. Giacosa made his first wine, a Barbaresco Riserva, in 1961. If well stored, the 1961 Riserva is still sublime. Up until the mid-1960s, Barolo and Barbaresco were blended wines. Some vineyards were prized for their aromatics, while others sought out for their fruit and/or structure. The prevailing wisdom was to combine the best attributes of several sites to make a complete, well-balanced wine. Around this time, well-known Italian wine writer Luigi Veronelli began pushing Piedmontese growers to emulate French producers, especially those in Burgundy, by bottling single-vineyard wines to exalt the attributes of specific sites. 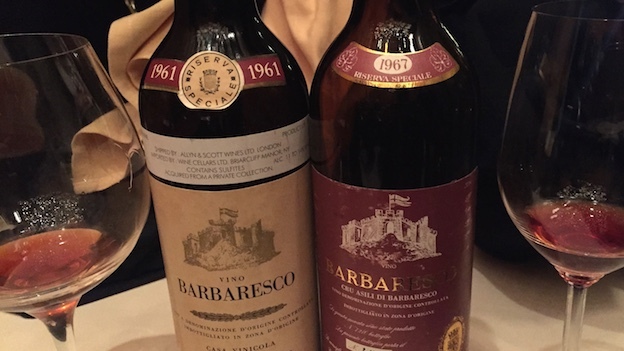 Indeed, some of the Giacosa labels from this era make use of the word ‘Cru' as can be seen in the bottle of 1967 Asili Barbaresco Riserva above and the 1964 and 1968 Santo Stefanos below. Note that the 1969 has 'Cru' marked out. The connection between Piedmont and France might seem surprising, but Piedmont was in fact part of France from 1798 to 1814, and some cities belonged to House of Savoy as far back as the 11th century. Traces of French culture remain in Piedmont even today, especially among the older generation of growers who are far more likely to speak French than English. In 1964, Giacosa made his first declared single-vineyard wine, the 1964 Barbaresco Riserva Speciale Santo Stefano, which is still a magical bottle. Although often placed in the traditionalist camp, the truth is that Giacosa was much more of an innovator than he is given credit for. Giacosa repeatedly disregarded the conventions of his time and forged his own path, most notably in breaking way from the wishes of his father. He was among the first producers to send his wines out for laboratory analysis and was an early adopter of temperature controlled fermentation in stainless steel. Giacosa preferred French oak over the more traditional Slavonian oak for his casks, and unlike many of his peers, Giacosa never favored extended aging in oak, but instead believed that aging in bottle before release was critical. While Bruno Giacosa will rightly be remembered for the many epic wines he made during a long and brilliant career, his judgment was not perfect. Perhaps most importantly, Giacosa was late to grasp the importance of owning estate vineyards. The overwhelming majority of old guard families – both Mascarellos and Conternos and many others – understood the challenges created by the rising price of land and the inherently unsustainable nature of relying on purchased fruit. Giacosa made brilliant wines from a number of sites – indeed, one might compellingly argue the best wines ever made from many vineyards – before losing access to them, including Rocche di Castiglione, Villero, and the crown jewel of them all, Collina Rionda. Giacosa also did not plan for the future. He kept no library of his wines, nor did he establish a succession plan. To be fair, Giacosa has plenty of company in both of these areas. Italy’s fatalist culture offers plenty of fabulous living in the moment and la dolce vita, but unlike the US, for example, where the culture is built on the fundamental belief that tomorrow will be better than today, Italians believe the exact opposite and act that way. Dante Scaglione joined Bruno Giacosa in 1992 after about a decade of working at a nearby lab where he handled the technical analyses of Giacosa's wines. Scaglione remained by Giacosa's side until 2008, when he left during a bitter family dispute. I have fond memories of Scaglione in Bruno Giacosa's tasting room. Always serious and wearing a traditional apron, Scaglione represented then, as he does today, the true artisan craft of winemaking. 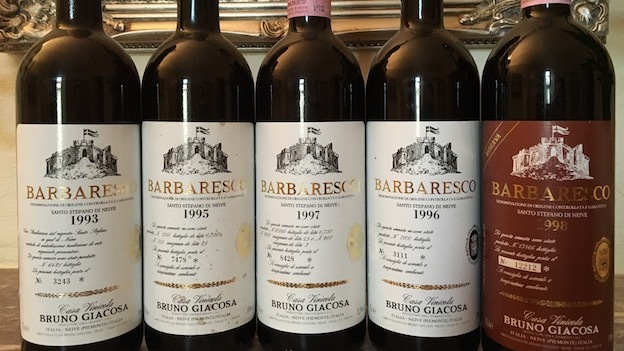 Together, Giacosa and Scaglione made a number of breathtaking wines, especially in 2001, 2004, 2005 and 2007, the modern-day counterparts to the great vintages of the 1960s, 1970s and 1980s. Sadly, Bruno Giacosa suffered a debilitating stroke in 2006. It is no secret that quality has taken a serious downturn since the 2008 vintage, but I will not belabor that point here. I remain hopeful that the winery will be able to return to a high level of quality at some point in the future. Scaglione, the one and only true heir to Bruno Giacosa’s legacy, has since returned to the winery as a consultant - good news for all of us who admire these wines - while expanding his roster of clients to include a number of the very best estates in Piedmont. 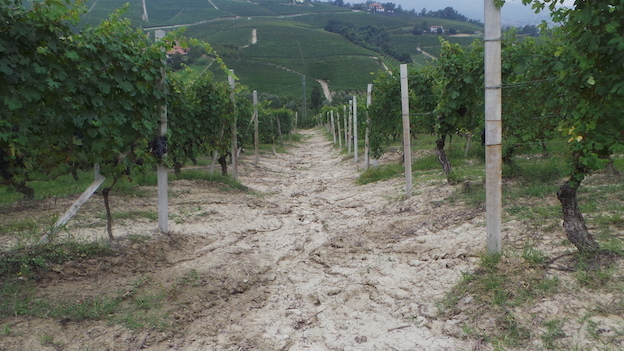 Among Bruno Giacosa’s vast contributions is showing the potential of many of the Langhe’s top vineyards. Collina Rionda, Villero, Rocche di Castiglione, Falletto and Asili are some of the many sites that the world became aware of through Giacosa’s mesmerizingly beautiful wines. But one vineyard occupies a special place in the Giacosa canon, because it is the source of the longest string of wines in the estate’s history and many of Giacosa’s most epic wines. That vineyard is Santo Stefano, where Giacosa made wine from 1964 (the 1961 is reputedly all Santo Stefano) through 2011. Santo Stefano and the Albesani district in 3-D. Image courtesy of Alessandro Masnaghetti. Used with permission. 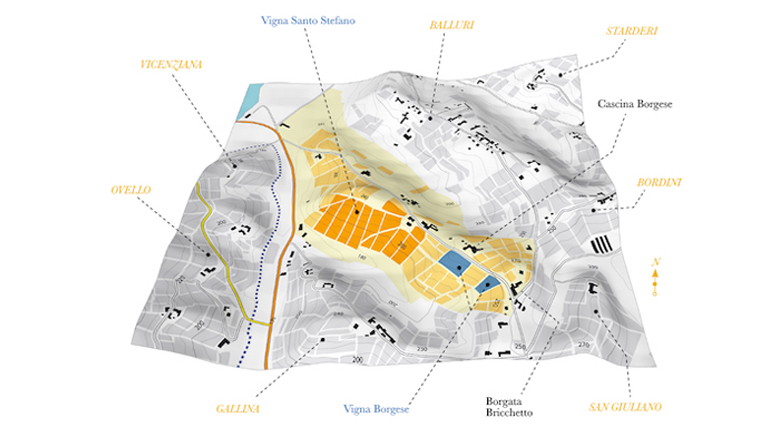 Today, Santo Stefano is referred to as a vineyard within the broader Albesani Menzione Geografica Aggiuntiva, as shown in the accompanying vineyard map. Some of the best views of Santo Stefano are from Gallina, which faces Santo Stefano, and the part of Ovello that looks towards Neive. The original parcels of Santo Stefano are those that are that are bisected by the horizontal access road and the blocks that follow moving west (left on the drawing above) towards the Tanaro River. It is impossible today to ascertain when Bruno Giacosa first started buying grapes from Santo Stefano, but we do know his contract pre-dates the Stupinos’ ownership of the vineyard. It is therefore possible, if not highly likely, that some, perhaps all, of the fruit that went into Giacosa’s iconic 1961 Barbaresco Riserva came from Santo Stefano. Interestingly, throughout his entire time at Santo Stefano, Giacosa was a fruit customer and had no input on farming. Yields were never especially low. And yet the wines are brilliant testaments to the pedigree of this land, especially in the years in which Giacosa elected to bottle his iconic Red Label Riserva. Giacosa's last Riserva from Santo Stefano was the 1998, after which the focus for the Riserva program shifted to estate vineyards. 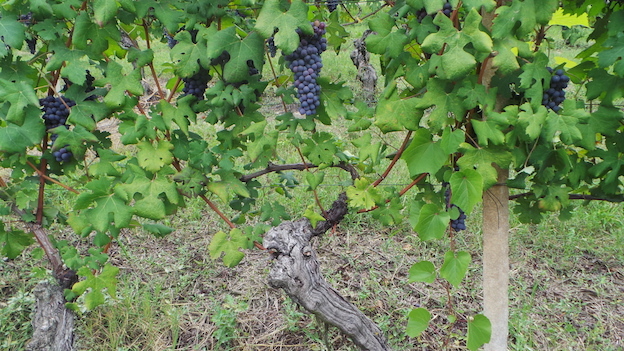 Giacosa bought fruit from Santo Stefano through the 2011 vintage. Starting with 2012, all of the fruit has been vinified by the Castello di Neive. The wines in this article were tasted over the course of two evenings in October, 2016. With just ten people, we all had an opportunity to taste and revisit the wines at a leisurely pace throughout the course of both nights. All of the wines were opened a few hours before service, checked for any issues and/or taint, and decanted to remove sediment. As is my custom for tastings like this one, I wrote the accompanying notes before the start of the meals. I would like to thank a number of people who made significant contributions to this tasting and article. Andrea Alciati and Josh Eisenhauer at Guido da Costigliole in the Relais San Maurizio and Giampiero Cordero at Il Centro all have Nebbiolo running through their veins. The service of wines on both evenings was impeccable. Italo Stupino and my dear friend and mentor, Il Professore, were both gracious in sharing their historical perspectives. Last but not least, my esteemed colleague Alessandro Masnaghetti contributed a map of Santo Stefano and the Albesani district. Most of all, though, I am deeply indebted to my parents, who first introduced me to Bruno Giacosa’s wines when I was in high school. Given the relative strength of vintages, I chose to serve this set of wines starting from oldest to youngest. I thought the wines of the early 1990s, the 1993 in particular, might be too faded to taste at the end of the meal and I also wanted to finish on a high note. The wines certainly validated that decision, as we finished the evening with a trio of superb Barbarescos from the 2004, 2005 and 2007 vintages. The 1993 Barbaresco Santo Stefano is a perfect wine to start the evening, as it introduces a number of themes without being so serious or important as to be overpowering. Sweet tobacco, leather and a host of fully mature, tertiary notes give the wine its distinct personality. There is plenty of depth to the fruit, but the aromatics are fully tertiary. For that reason, any remaining bottles are best finished off sooner rather than later. One of the real surprises of the evening, the 1995 Barbaresco Santo Stefano is fabulous. A classic bouquet of sweet rose petal, mint, hard candy and red cherry is super-alluring. Time in the glass allows the wine to gain in breadth and textural expansiveness, but the wine’s knock-out aromatics steal the show. I have had a number of terrific 1995s over the past year, including Giacosa’s Barbaresco Santo Stefano, which is a jewel of a wine. The 1995 is not huge or imposing, but its balance is beyond reproach. Giacosa’s 1996 Barbaresco Santo Stefano is a picture-perfect example of the year. Still austere and somewhat compact, I imagine the 1996 will never be an especially forthcoming wine. Even so, the 1996 possesses a super-classic profile of sweet red cherry, pomegranate and rose petal, with a kick of white pepper that adds aromatic intrigue and lift. Readers who appreciate the clenched, old school style typical of this vintage will find plenty of those qualities here. Longevity will be determined by the quality of the corks and storage, as the wine itself is pretty much eternal. As it often does, the 1996 Santo Stefano evokes memories of Giacosa’s brilliant 1970s and 1980s wines. The 1997 Barbaresco Santo Stefano is a pretty wine, but it is also a touch faded. Dried cherry, kirsch, smoke, spice cake, licorice and sweet tobacco add to an impression of a wine that is pretty much fully resolved. I would prefer to drink the 1997 sooner rather than later, while there is some freshness left to match the wine’s soft, nuanced feel. Stylistically, the 1997 bears some resemblance to the 2000 – which is not surprising given that both were warm vintages – but is perhaps a bit richer and deeper, but also more forward. The 1998 is the last Barbaresco Santo Stefano Giacosa bottled as a Riserva. For years, the 1998 flew under the radar, likely a victim of a vintage that at the time was considered very good, but not great. Dried cherry, star anise, pomegranate, dried rose petal and deeply spiced notes are some of the signatures. The 1998 is deep, fleshy and quite giving in personality. In any tasting, there are bound to be wines that don’t show as well as they can. In this vertical, it is the 1998. This is a fine bottle, but I have had better. Although a bit slender, the 1999 Barbaresco Santo Stefano is in great shape tonight. Still fresh and nicely delineated, the 1999 has also aged quite well. The 1999 has always been a slender, narrowly built wine, especially next to the surrounding vintages, but tonight it is quite expressive and absolutely delicious. I would not wait too long, as the 1999 will be much less pleasurable once the modest fruit starts to fade. This is without question the best and most expressive bottle of the 1999 I have had. The 2000 Barbaresco Santo Stefano is in the zone. Ripe, silky tannins give the wine its soft, inviting personality. Layered, racy and sensual in the glass, the 2000 possesses lovely nuance, with plenty of bright red berry and cinnamon character. The 2000 is one of the more open-knit, exotically ripe wines in this vertical. Then again, that is very much the style of the year. The largely resolved tannins and over-all feel suggest the 2000 is peaking and perhaps starting to fade. I am shocked (pleasantly, I must say), by how closed the 2001 Barbaresco Santo Stefano is. Powerful, tightly wound and totally closed down, the 2001 exudes class. Orange rind, tobacco and smoke add striking aromatic complexity to the intense dark fruit. Today, the tannins are surprisingly intense and raw, so readers will have to be patient. The 2001 is superb, but the wine’s full personality will not be on display for at least another few years. There is a good bit of upside here. The 2004 Barbaresco Santo Stefano shows the pedigree of this great Piedmont vintage. An ample, complex wine, the 2004 fills out in all directions with myriad of aromatics and layers of flavor. Dark red stone fruit, exotic spice, leather and licorice all develop in the glass. The wine’s pure textural finesse and creaminess show what makes the finest 2004s so appealing. One of the highlights of the first night of this vertical, the 2005 Barbaresco Santo Stefano is yet another poignant reminder of how strong this vintage can be. Bright, focused and energetic, the 2005 is wonderfully alive in the glass, with plenty of cranberry, plum, red cherry and mint flavors. Today, it is the 2005’s sense of energy that places it among the wines of the night. The 2007 Barbaresco Santo Stefano captures all of the qualities that makes this such an appealing vintage. Gracious, aromatic and beautifully lifted, the 2007 offers lovely freshness to balance the overt fruit of the year. On this night, I am quite surprised by how firm the tannins are, which is naturally a very good sign for the wine’s potential longevity. A closing flourish of sweet red cherry, flowers and crushed rocks rounds things out in style. The second night of this tasting was one of the greatest nights of wine I have ever experienced. All of the Red Label Riservas except one (1998) were kept for the second evening of this vertical. Here I chose to start with the youngest wine (1990) and work back to the (1964), an approach that worked beautifully. The second night of this vertical gets started in grand style. Bruno Giacosa’s 1990 Barbaresco Riserva Santo Stefano plays true to type. Powerful in the glass, with the soft contours and glycerin richness of a warm vintage, the 1990 possesses superb pedigree from the very first taste. Heady, intense and flamboyant, the 1990 is peaking today. It will hold for another decade or more, but I don’t see much upside to be gained from further cellaring. 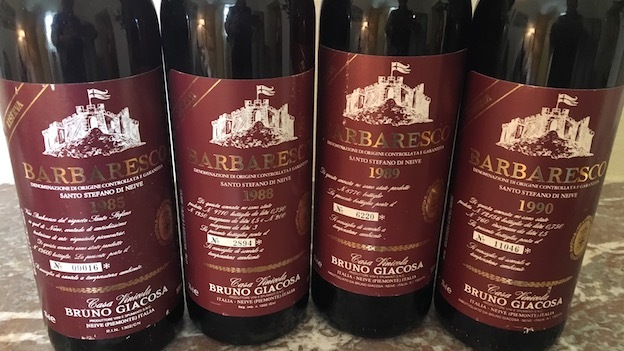 Of the wines of the 1980s, the 1989 Barbaresco Riserva Santo Stefano vies for the 1982 as the best wine of a decade that saw Bruno Giacosa make a dizzying array of stunning Barolos and Barbarescos. Still explosive and heady, the 1989 captures the best of Santo Stefano vineyard as interpreted by Bruno Giacosa. There’s not much more to say. Heady Nebbiolo aromatics and dense fruit infuse this exotic, deeply satisfying Barbaresco from Bruno Giacosa. The 1989 was the first young Giacosa Riserva I bought on release. The price was $55 a bottle, which was a fortune for me at the time. Many things have changed since then. But the wine? Well, it is as monumental as ever. Now, after many years of trying and countless poor/flawed bottles, I can finally say I have had what is likely a representative bottle of Giacosa’s 1988 Barbaresco Riserva Santo Stefano. Lithe and ethereal on the palate, the 1988 is now fully mature, but also has just enough freshness to last for another few years if stored in a perfect cellar. Scents of dried cherry, menthol, worn-in leather, molasses and tobacco shape the lilting finish. Every bottle of the 1988 I have ever tasted in the US has been flawed. This bottle, from a European cellar, is at least sound. The 1988 is holding onto the last vestiges of life. It is also a rare miss from Bruno Giacosa in a decade that yielded so many truly memorable wines. The 1987 Barbaresco Santo Stefano, from a cold, rainy vintage that is now mostly forgotten, is faded and past the point of being able to provide any real pleasure. Full-bodied, unctuous and powerful in the glass, the 1985 Barbaresco Riserva Santo Stefano is a total turn on. Exotic spice, smoke, tobacco, dried rose petal, leather and licorice build into a heady crescendo of aromas, flavors and textures. Although the 1985 is currently at a glorious peak of expression, I don’t expect it will improve much from here. Readers lucky enough to have had the 1985 know just how magical it is. Any remaining bottles are best enjoyed over the next decade or so. At its best, the 1982 Barbaresco Riserva Santo Stefano is one of the greatest wines I have ever tasted from Bruno Giacosa. Sweet red cherry, raspberry, rose petal, mint and hard candy give the wine its sensual, inviting personality. Medium in body, persistent and beautifully focused, the 1982 is a Riserva that speaks to power over finesse. Readers fortunate enough to own the 1982 will want to check in on their bottles. Although the 1982 will hold for at least a few years, it won’t get any better than it is today. It would be a shame to miss the 1982 at its height of expression, as it is a truly magical bottle. An epic, legendary bottle, Giacosa’s 1978 Barbaresco Riserva Speciale Santo Stefano is one of the most anticipated wines of the night. It does not disappoint. Fresh, powerful and structured, the 1978 SSR is the embodiment of this historic Piedmont vintage. Layers of dark fruit, menthol, spice and dried herbs unfurl in the glass as this potent, deep Barbaresco shows off its compelling, alluring personality. At this point, it is safe to say the wine is eternal. The longevity of bottles will be determined by how well corks hold as opposed to the quality of the wine itself. What a privilege it is to taste and drink the 1978 from a pristine bottle. One of the surprises in tasting, the 1974 Barbaresco Santo Stefano has aged brilliantly. The 1974 doesn’t have the pedigree of the Red Labels that surround it, but it has exceptional balance and tons of personality. Perhaps more importantly, it has aged gracefully to the point of being strikingly beautiful on this night. Scents of leather, tobacco and dried flowers add lovely shades of nuance throughout. What a beautiful wine this is. The 1971 Barbaresco Riserva Speciale Santo Stefano is a super-rare wine. I have only seen it a few times and never tasted it from a pristine bottle like this one. Sweet, silky and wonderfully nuanced, with the ripeness of the vintage still very much in evidence, the 1971 possesses exceptional balance from start to finish. Readers lucky enough to still own the 1971 won’t want to wait too much longer, as it won’t get better than it is right now. If anything, the 1971 might be slightly past peak. Even so, it is glorious. There is so much to like about the 1970 Barbaresco Santo Stefano. Among other things, the 1970 has aged remarkably well. 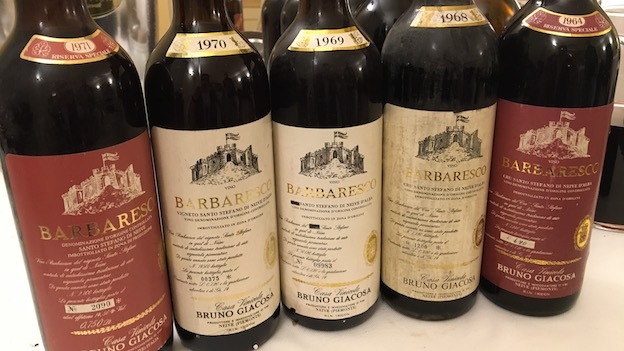 Next to some of the more finessed, sensual wines in this tasting, the 1970 shows a more virile, potent expression of Nebbiolo, as much as one can say that for a wine that has celebrated its 46th birthday! Hints of lavender, smoke, dried herbs and anise add nuance throughout, but it is the wine’s integrity and overall freshness that I find most notable on this night. Beams of tannin give the wine its distinctive shape and feel. At this point, it is probably safe to say the 1970 will always remain muscular and tannic. Nineteen seventy has long lived in the shades of 1971, and while the 1970 don’t quite have the profoundness of the 1971, the best examples come very, very close. In a word: superb. Nineteen sixty-nine is one of the most difficult vintages in Piedmont to learn about. It was before my time, so I can’t add any personal insights. Contemporary accounts describe a cold, rainy vintage. Even so, most examples I have tasted recently have actually held up quite well. And that is the case with Bruno Giacosa’s 1969 Barbaresco Santo Stefano. Fully mature and also a touch angular, the 1969 offers up an appealing melange of leather, smoke, tobacco, tar and dark fruit. While it is not an exceptional wine, the 1969 shows what Giacosa was capable of in weaker years when he was at the peak of his powers. For that reason alone, this is a beautiful wine to savor and appreciate. The 1968 Barbaresco Santo Stefano is another pleasant surprise. Worn-in leather, dried flowers, cocoa, spices and dark fruit, along with mid-weight structure give the wine its shape and overall personality. I found myself coming back to the 1968 often during the evening. Although not the most profound bottle on the table, the 1968 is exceptionally harmonious and well-balanced. Moreover, it does not pale at all in comparison with some of the heavyweights that surround it; the 1968 is simply a product of an average or above average, but not great, vintage. That is exactly what is in the glass. A fitting conclusion to the evening, Giacosa’s 1964 Barbaresco Riserva Santo Stefano embodies all the reasons we buy wines to cellar them, most importantly the conviction that great wines can ascend to the divine if given enough time in bottle to become fully expressive. The 1964 is poured and all conversation ceases. Immediately. This is what fine, aged Nebbiolo is all about. Translucent in color, with no signs of oxidation, the 1964 is simply magical. Dried rose petal, herb, mint and red stone fruit notes grace the palate in an utterly exquisite expression of this great Neive vineyard. What a treat it is to taste and drink Bruno Giacosa’s first single-vineyard Barbaresco.